From the front badge to the rear taillights, luxury vehicles are counted on to provide refinement and status every time you step inside and press the pedals. The iconic snake and cross of Alfa Romeo and silver circle of Mercedes-Benz are two of the most recognizable on the market, which has transformed these model brands into the two highest-visibility manufacturers that the industry has ever seen. This isn't without merit though, as Alfa Romeo and Mercedes have routinely proven their ability to give you everything you could ever need out of your driving experience. So, the next time you head out for the dealership, what's your choice? Before you answer that, be sure to keep reading and check out our Alfa Romeo vs. Mercedes-Benz comparison; both OEMs have much to offer, and we don't want to keep you in the dark. Let's see what each can do! In the case of the Alfa Romeo model family, there's an emphasis on quality over quantity. Its 4C, Giulia and Stelvio vehicles are all either near or at the tops of their respective performance coupe, sedan and SUV classes, with best-in-class horsepower, seriously advanced all-wheel drive systems, selectable drive modes and more that can contour to whatever terrain you're headed for. All in all, it makes the Alfa Romeo line a true force to be reckoned with for all other competition! As we've seen throughout the automotive industry's history, Mercedes-Benz is never a brand that you should count out. 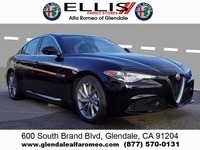 From its E-Class roadsters to its C-Class sedans and GLC SUVs, you can achieve competitive fuel economy, infotainment and power output from the brand, even though its prices are well above what it costs to own an Alfa Romeo. Never one to rest on its laurels, Alfa Romeo has made it a goal for all of its models to solidify themselves as the best in their class year after year, which is something it's achieved for 2018, especially compared to what Mercedes-Benz has to offer. With Adaptive Cruise Control, Lane Departure Warning and Collision Warning standard on new Alfa Romeo models, as well as a "Car of the Year" award bestowed upon the 2018 Giulia, you can always count on Alfa Romeo to suit whatever needs you have for the road – and life – ahead. Interested in a Alfa Romeo?